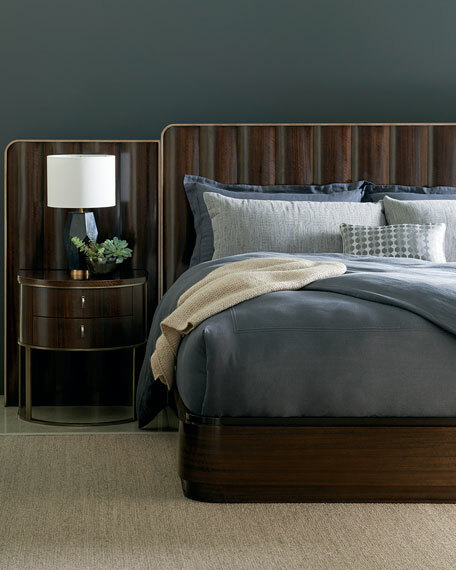 Accentuate the updated 1940s design sensibilities of our Modern Streamline bed by adding complementary 53" by 30.5" wing panels on either side of the headboard. Styled in curved panels of fumed figured eucalyptus that is finished to a high sheen in Aged Bourbon and trimmed in Smoked Bronze, these panels instantly make a powerful statement. Handcrafted bed panels; bed sold separately. Asian hardwood and fumed quartered figured eucalyptus. Eucalyptus wrapped vertical panels in aged bourbon with smoked bronze wood trim around perimeter. Each wing panel has a cord hole to provide access behind night stands. Panels are sold as one carton and packaged as a pair, right side and left side. 30.5"W x 2.8"D x 53"T.
Boxed weight, approximately 69.5 lbs.